These men bodyguard the European leaders in the New World. 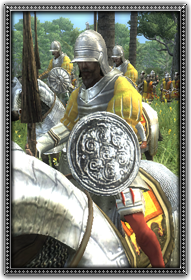 Equipped for the conditions with a breastplate and metal buckler, these men have strong armour but also maintain good mobility. The natives of the New World find it extremely difficult to hurt these powerful warriors who guard their leader with near religious fervour.